Fall leaves on a bridge at Coffee Creek Park in Chesterton, Indiana. 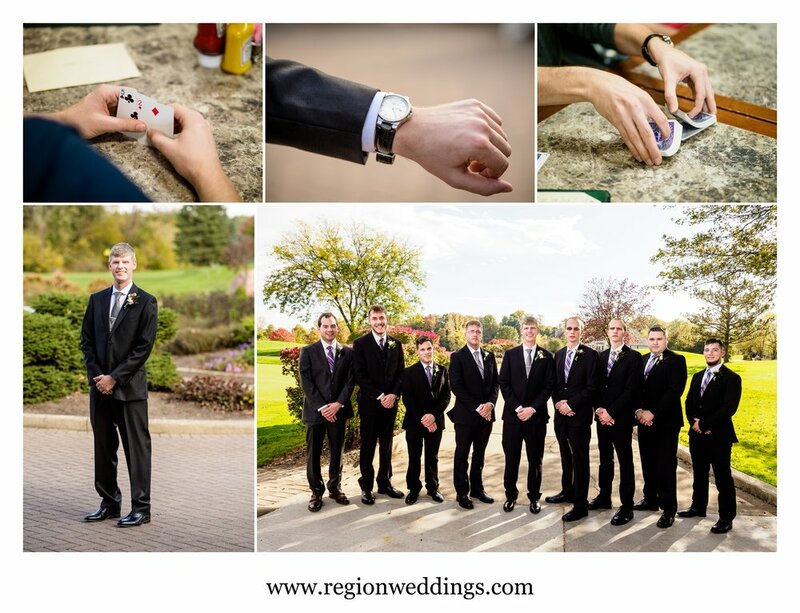 So many great moments at Jessica and Mitchell's Fall wedding at Sand Creek Country Club in Chesterton, Indiana. We started out in the morning inside the bridal suite with all of the correct ingredients to a successful wedding day - great friends, loving family, hair and make up and caffeine from Starbucks!! Bridal prep at the Sand Creek bridal suite. Mother of the bride with her daughter on wedding day. The bride ready for her big day. The guys also had the correct ingredients - a deck of cards and an accurate watch to keep them on time for the forthcoming first looks. Jessica had two first looks with the first one being with her Dad. He graciously stood patiently awaiting her as I had him staring out to nowhere. They were a bundle of laughs as she approached and at the end he gave her a kiss on her hand. It was one of many great moments of the day. We then whisked her away via golf cart only to be driven right back to have a reveal with Mitchell. 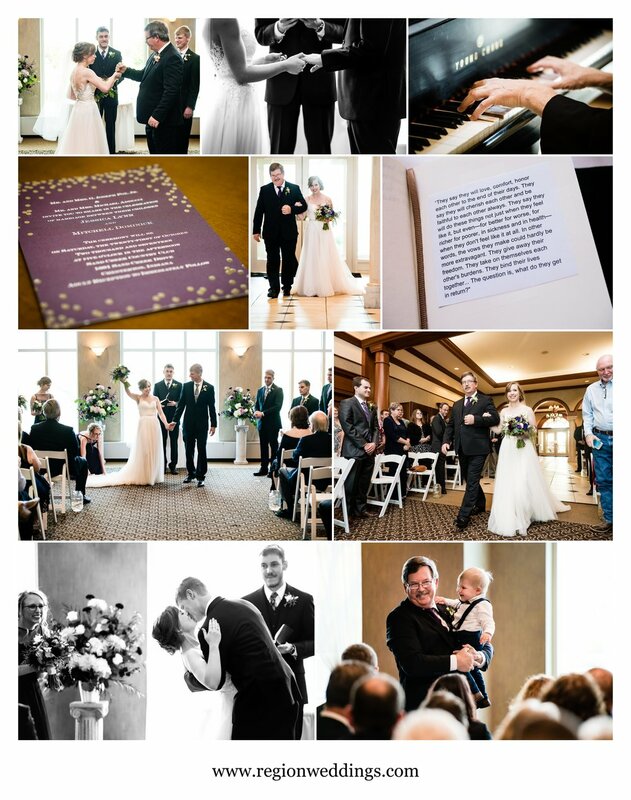 First look with Dad at Sand Creek Country Club. 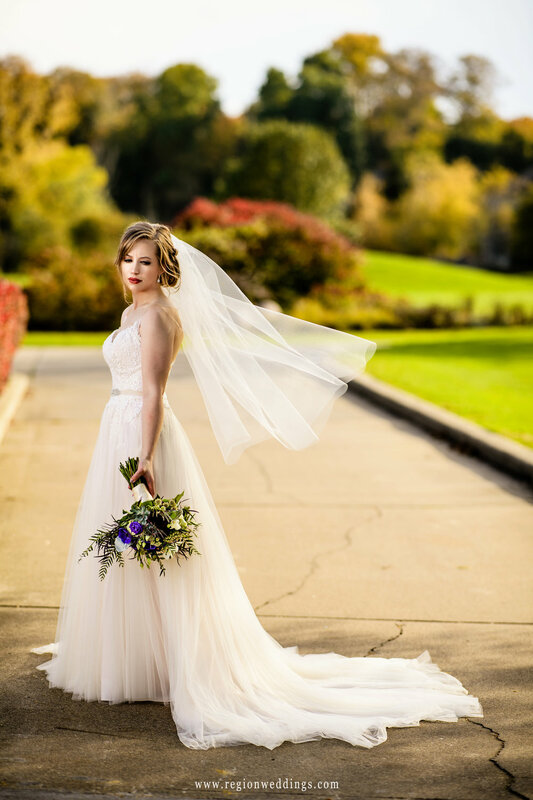 First look / reveal for bride and groom at Sand Creek Country Club. After the wedding party offered their congratulations we were off and running with portraits in and around the beautiful Sand Creek garden and then we went looking for Autumn leaves at Coffee Creek Nature Preserve. Bride and groom share a romantic kiss in the Sand Creek garden in Chesterton, Indiana. Bride and groom at their Fall wedding at Sand Creek Country Club. The bride's veil is carried by the wind at her Fall wedding in Chesterton, Indiana. The wedding party chillin' on the back patio of Sand Creek Golf Course. Thankfully no groomsmen fell into the creek!! 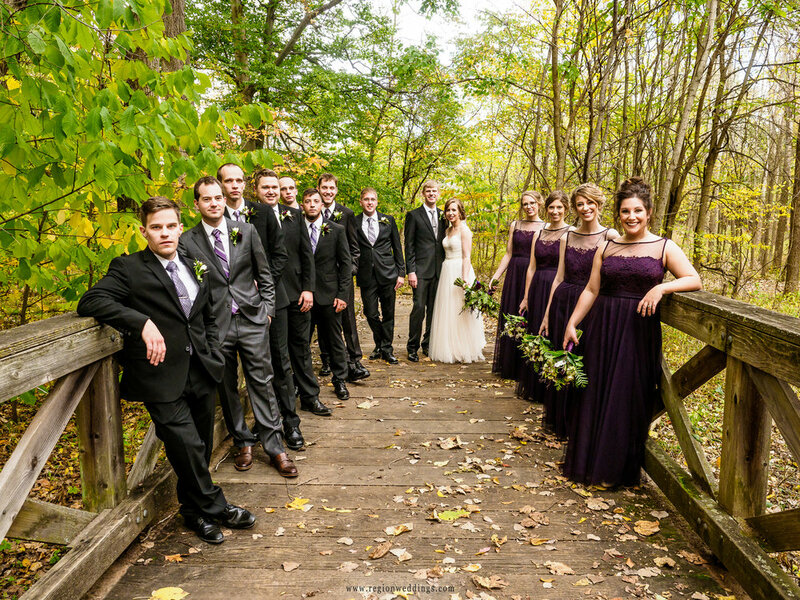 The groomsmen and bridesmaids on a bridge at Coffee Creek Nature Preserve. Wedding party photo on a leaf covered bridge. The bride and groom surrounded by golden Fall color. The ceremony featured a secret handshake from Dad and daughter as well as blessings from the internet via the wedding officiant and groomsman. The piano playing made a lovely background to the entrance and exit of the new Mr. and Mrs. Adducci. Wedding ceremony at Sand Creek Country Club in Chesterton, Indiana. Light streams in behind the bride and groom at Sand Creek in Chesterton, Indiana. The Sand Creek reception room was aglow in purple and the entrance had past weddings on display in frames and I can't forget the Albanese chocolates for each guest either. Wedding decoration in the Sand Creek reception room. First dances for bride and groom and their parents. Party time on the dance floor during a wedding reception at Sand Creek Country Club. I hope you have enjoyed this sneak peek look at Jessica and Mitchell's Fall wedding at Sand Creek Country Club in Chesterton, Indiana. To inquire about your big day, please fill out the Contact Form. To see more images from this and other weddings, follow the social media channels below.